Living on the edge can lead to spectacular improvements or disastrous collapse. One hears about living on the cutting edge of new technology. Seeking, studying, obtaining, implementing and finally tracking new forms of technology not only can keep a company alive in today’s tough environment, but can propel it far ahead of its competition. At the other extreme, too many people worldwide recognize that living on the edge of the financial cliff often leads to very bad consequences. For example, many went too deeply into debt when buying housing. What was thought to be a solid, safe and constantly improving lifestyle soon became their downfall. These persons had not taken time to define the edge of their monetary cliff. Creation of a safety margin was not necessary. Life was good. Then one day the housing bubble burst. As the ground pulled out from under them, they were over the edge of the cliff and free falling toward disaster. A similar story describes the disasters occuring in too many press shops. Here the deformation cliff replaces the financial cliff. The edge of this deformation cliff is the onset of necking in your stamping. Once the neck starts, deformation localizes within the neck. The remainder of the stamping no longer contributes to the necessary increase in length of line. A severe cosmetic defect appears. Too many parts experience failures due to insufficient deformation. A formability deficit is created. What was thought to be a solid, safe and stable part suddenly becomes a major problem. No one had taken the time to define the edge of the deformation cliff for the part. Others argue that creation of a deformation safety margin makes forming the part too conservative. Early die tryout goes well because the part holds water and meets class A surface requirements. Then things turn sour. Perhaps the day before die buyoff, the parts begin to split. Even worse, they may not split until production begins in the customer’s plant. Schematic showing possible forming severities of different parts relative to the edge of deformation cliff. indicate whether any good parts can even be made. The best condition is B, where some parts fail and some do not. Looking at the sketch, one knows exactly where the part is located (2) on the edge of the cliff with no safety margin. That some parts are formed without failure means that the forming system (die, material, lubricant and press) is capable of making good parts. The goal now is to back the part a from the edge. Yes, condition C suggests that the forming system may continue to make all good parts. However, where on the cliff is the part located? That is the big unknown. A part located at (3) with a proper safety margin is the optimum location. If the part is located just before the edge of the cliff (2), there is a good chance of failed parts in the future. If the part is located at (4), the part has an excessive safety margin and is a good candidate for a cost-reduction program. The schematic represents only a concept. How is this concept converted to hard numbers for press-shop application? A good operating procedure for the press shop is the FLD (forming limit diagram) and the CGA (circular grid analysis) procedure. 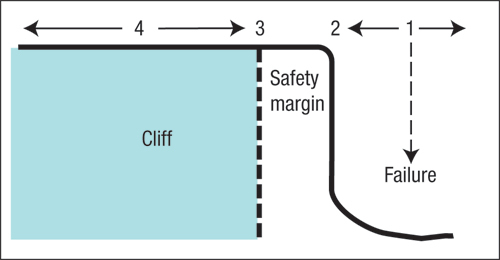 The FLD provides the strain combinations that define the edge of the cliff (2) and the safety margin (3). FLDs are available for most steels plus some aluminum and other alloys. Measuring the values of circle-grid strains locate the part relative to the edge of the cliff. The severity of the part can be assessed from the first part made off of the die. A better procedure is creating the virtual part on the computer. The FEA program in the computer will form the part and provide the strain values everywhere on the part. The FLD for many alloys already is in the computer. The severity of the part is rapidly obtained. No hard tooling needs to be constructed. If necessary, changes to any of the forming system input parameters can be rapidly entered into the computer to determine what increases or decreases the severity. The best procedure is to create the virtual part in the computer and then test the part for robustness and susceptibility to failure. Enter limits of process variables into the program, which then runs a design of experiments (DOE) program with Monte Carlo variation. The output may tell you that 90 percent of the parts will be in zone (4) of the schematic. However, certain combinations of variables will force 6 percent of the parts to be located between points (2) and (3) and 4 percent will go over the edge of the cliff. That level of information cannot be obtained by press-shop trial-and-error testing.